Indy Architectural LED downlight luminaires output almost 1,000 lumens from 18 watts input. Features a remote phosphor technology for color consistency. 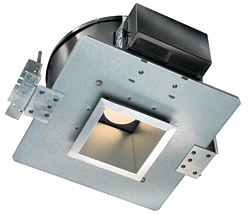 Available in 3,000K and 4,100K color temperatures and round, square, or cylindrical housings. Rated for 50,000 hours at 70 percent lumen maintenance.